Editor – The cache‑slice method discussed in Filling the Cache Slice‑by‑Slice was introduced in NGINX Plus R8. For an overview of all the new features in that release, see Announcing NGINX Plus R8 on our blog. We need a simple, reproducible test framework to investigate alternative strategies for caching with NGINX. It takes nearly 11 seconds for the file to be delivered, which is a reasonable simulation of the performance of an edge cache that is pulling large files from an origin server over a bandwidth‑limited WAN network. Once NGINX has cached an entire resource, it services byte‑range requests directly from the cached copy on disk. What happens when content is not cached? When NGINX receives a byte‑range request for uncached content, it requests the entire file (not a byte range) from the origin server and begins streaming the response to temporary storage. As soon as NGINX receives the data required to satisfy the client’s original byte‑range request, NGINX sends the data to the client. In the background, NGINX continues streaming the full response to a file in temporary storage. When the transfer is complete, NGINX moves the file to the cache. NGINX sends a request to the origin server for the entire 10Mb.txt file, and starts loading it into the cache. As soon as the requested byte range is cached, NGINX delivers it to the client. As reported by the time command, this happens in just over 5 seconds. 192.168.56.10 - - [08/Dec/2015:12:04:02 -0800] "GET /10Mb.txt HTTP/1.0" 200 10486039 "-" "-" "curl/7.35.0"
If we repeat the curl request after the entire file is cached, the response is immediate because NGINX serves the requested byte range from the cache. Every new request to the origin server triggers a new cache‑fill operation and the cache doesn’t “settle down” until a cache‑fill operation completes without other operations in progress. Imagine a scenario where users start viewing a video file immediately after it is published. If the cache‑fill operation takes 30 seconds (as an example), but the delay between additional requests is less than this, the cache might never fill and NGINX would continue to send more and more requests for the entire file to the origin server. Cache lock – With this configuration, during the cache‑fill operation that is triggered by the first byte‑range request, NGINX forwards any subsequent byte‑range requests directly to the origin server. 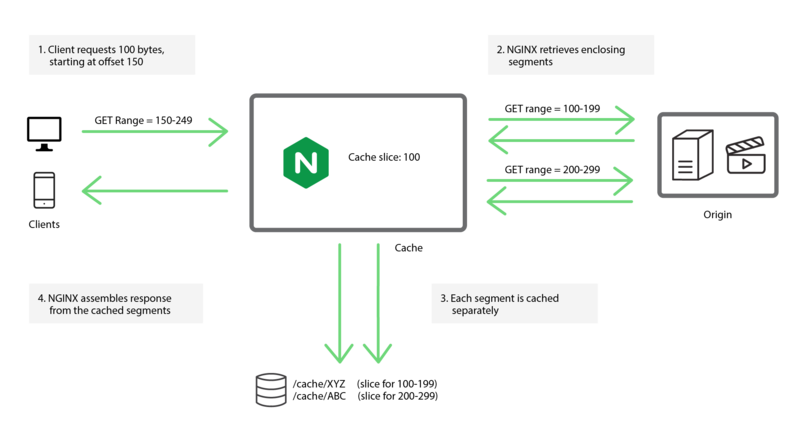 After the cache‑fill operation has completed, NGINX serves all requests, for both byte ranges and the entire file, from the cache. Cache slicing – With this strategy, introduced in NGINX Plus R8 and NGINX 1.9.8, NGINX segments files into smaller subranges that can be retrieved quickly, and requests each subrange from the origin server as required. proxy_cache_lock on – Sets the cache lock. When NGINX receives the first byte‑range request for a file, it requests the entire file from the origin server and starts a cache‑fill operation. NGINX does not convert subsequent byte‑range requests into requests for the entire file or start a new cache‑fill operation. Instead it queues the requests until either the first cache‑fill operation completes or the lock times out. proxy_cache_lock_timeout – Controls how long the cache is locked (the default is 5 seconds). When the timeout expires, NGINX forwards each queued request to the origin server unmodified (as byte‑range requests with the Range header preserved, not as requests for the entire file) and does not cache the response returned by the origin server. In situations like our test with 10Mb.txt, the cache‑fill operation is likely to take a significant time, so we set the lock timeout to 0 (zero) seconds because there’s no point to queuing the requests. NGINX forwards any byte‑range requests for the file to the origin server immediately until the cache‑fill operation completes. proxy_cache_lock_age – Sets a deadline for the cache‑fill operation. If the operation doesn’t complete within the specified time, NGINX forwards one more request to the origin server. It always needs to be longer than the expected cache fill time, so we increase it from its default of 5 seconds to 200 seconds. proxy_cache_use_stale updating – Tells NGINX to use the currently cached version of a resource immediately if NGINX is in the process of updating the resource. This makes no difference on the first request (which triggered the cache update) but accelerates responses to clients for subsequent requests. The final line, with status code 200, corresponds to the completion of the first byte‑range request. NGINX modified this to a request for the entire file and triggered a cache‑fill operation. 192.168.56.10 - - [08/Dec/2015:12:18:51 -0800] "GET /10Mb.txt HTTP/1.0" 206 343 "-" "bytes=5000000-5000009" "curl/7.35.0"
192.168.56.10 - - [08/Dec/2015:12:18:52 -0800] "GET /10Mb.txt HTTP/1.0" 206 343 "-" "bytes=5000000-5000009" "curl/7.35.0"
192.168.56.10 - - [08/Dec/2015:12:18:53 -0800] "GET /10Mb.txt HTTP/1.0" 206 343 "-" "bytes=5000000-5000009" "curl/7.35.0"
192.168.56.10 - - [08/Dec/2015:12:18:54 -0800] "GET /10Mb.txt HTTP/1.0" 206 343 "-" "bytes=5000000-5000009" "curl/7.35.0"
192.168.56.10 - - [08/Dec/2015:12:18:55 -0800] "GET /10Mb.txt HTTP/1.0" 206 343 "-" "bytes=5000000-5000009" "curl/7.35.0"
192.168.56.10 - - [08/Dec/2015:12:18:46 -0800] "GET /10Mb.txt HTTP/1.0" 200 10486039 "-" "-" "curl/7.35.0"
Using a cache lock optimizes the cache‑fill operation, but at the cost of sending all subsequent user traffic to the origin server during the cache‑fill period. The Cache Slice module, introduced in NGINX Plus R8 and NGINX 1.9.8, offers an alternative method for filling the cache, which is more efficient when bandwidth is heavily constrained and cache‑fill operations take a long time. Editor – For an overview of all the new features in NGINX Plus R8, see Announcing NGINX Plus R8 on our blog. Using the cache‑slice method, NGINX breaks the file into smaller segments and requests each segment when it is required. The segments are accumulated in the cache, and requests for the resource are satisfied by delivering appropriate parts of one or more segments to the client. A request for a large byte range (or indeed, the entire file) triggers subrequests for each of the required segments, which are cached as they arrive from the origin server. As soon as all the segments are cached, NGINX assembles the response from them and sends it to the client. In the following configuration snippet, the slice directive (introduced in NGINX Plus R8 and NGINX 1.9.8) tells NGINX to segment each file into 1 MB fragments. When using the slice directive, we must also add the $slice_range variable to the proxy_cache_key directive in order to differentiate between the fragments of the file, and we must replace the Range header in the request so that NGINX requests the appropriate byte ranges from the origin server. We upgrade the request to HTTP/1.1 because HTTP/1.0 does not support byte‑range requests. NGINX satisfies the request by requesting a single 1 MB file segment – byte range 4194304–5242879 – which encloses the requested byte range, 5000000–5000009. 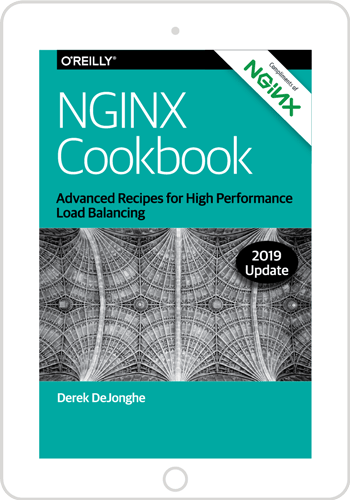 If a byte‑range request spans several segments, NGINX requests all of the required segments (that are not already cached) and then assembles the byte‑range response from the cached segments. The Cache Slice module was developed for delivery of HTML5 video, which uses byte‑range requests to pseudostream content to the browser. It’s ideal for video resources where the initial cache‑fill operation might take several minutes because bandwidth is constrained, and the file does not change after publication. Set the slice size to a value small enough that each segment can be transferred quickly (for example, within a second or two). This will reduce the likelihood the multiple requests will trigger the continuous‑updating behavior described above. On the other hand, it’s possible to make the slice size too small. If a request for the entire file triggers thousands of small requests at the same time, the overhead can be high, resulting in excessive memory and file descriptor usage and more disk activity. In addition, because the Cache Slice module splits resources into independent segments, it’s not possible to change the resource once it has been cached. The module verifies the resource’s ETag header each time it receives a segment from the origin, and if the ETag changes, NGINX aborts the transaction because the underlying cached version is now corrupt. We recommend that you use cache slicing only for large files that do not change once published, such as video files. If you’re delivering large resources using byte ranges, both the cache‑lock and cache‑slice techniques minimize network traffic and give your users great content‑delivery performance. Use the cache‑lock technique if cache‑fill operations can be performed quickly, and you can accept a spike of traffic to the origin server while the fill is in progress. Use the new cache‑slice technique if cache‑fill operations are very slow and the content is stable (does not change). Whichever method is appropriate for you, the NGINX team is here to help you build the perfect caching edge network or CDN for your content. Want to check out the caching techniques in NGINX Plus for yourself? Take advantage of our free 30‑day trial or contact us for a live demo.